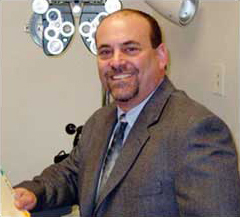 Dr. Steven Chado is a graduate of University of Maryland and the Pennsylvania College of Optometry and has been practicing optometry for the past 34 years. In 2006, Drs Steven and Beverly Chado opened the 2nd Eye to Eye location in Frederick, MD, where Dr. Steven Chado currently sees patients. In addition to his practice in Frederick, Dr. Steven Chado also manages optometric services at several military exchanges, including Norfolk Naval Echange, Walter Reid, Ft. Belvoir and Pearl Harbor.